On the 10th September 1990, the King Juan Carlos I and Queen Sofía inaugurated the Queen Sofía National Museum with a permanent collection which came to substitute the Spanish Museum of Contemporary Art. When it opened its doors, it stood as a modern, contemporary Spanish museum on an international scale. Nevertheless, its building has gone through many challenges in order to achieve this goal. To date, the artistic ground exhibited there has been constantly growing. 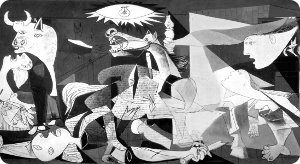 Perhaps it was the transferring of Picasso's "Guernica" to the Queen Sofía for its permanent collection, which was the decisive milestone in it now being considered one of the most important contemporary art museums in the world. 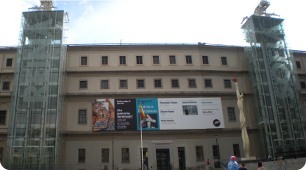 The Queen Sofía Museum program is based on a redefinition of the function of museums, on an alternative to the institution's historical models. Conceived to be a place that generates opportunities for sociability and discussion in the public sphere. The building which houses the collection was designed in the 18th century by the architect Francisco Sabatini to be built as a hospital (San Carlos hospital), and which was later modified and extended on numerous occasions. At one point, it was the object of urban planning which included its demolition. But, in 1977, after much debate, this was declared an artistic historic monument. Its geographical situation in the city (beside the Atocha roundabout) is privileged, opposite the Botanical Gardens and close to the Prado Museum. Between 1980 and 1988 installed a transparent lift towers which now give a modern image to the building. In 1988, it was made a National Museum. Monday to Saturday: 10:00 h to 21:00 h.
Sunday: 10:00 h to 14:30 h.
* Line 3 - Lavapiés station.